Yesterday I went with my niece and nephews to the Children’s museum. They are visiting from Australia, the weather was cold and cloudy, so it seemed a perfect outing. The museum has been renovated completely since I brought my own kids there years ago. I like the renovations, but found it difficult to navigate, because nothing was where I remembered it to be. We spent time in the play area, face-painting, Our Town, Forces at Work, and Laser room. We also built snowmen and other things with clay and made circuits in the art studio. A good time was had by all! 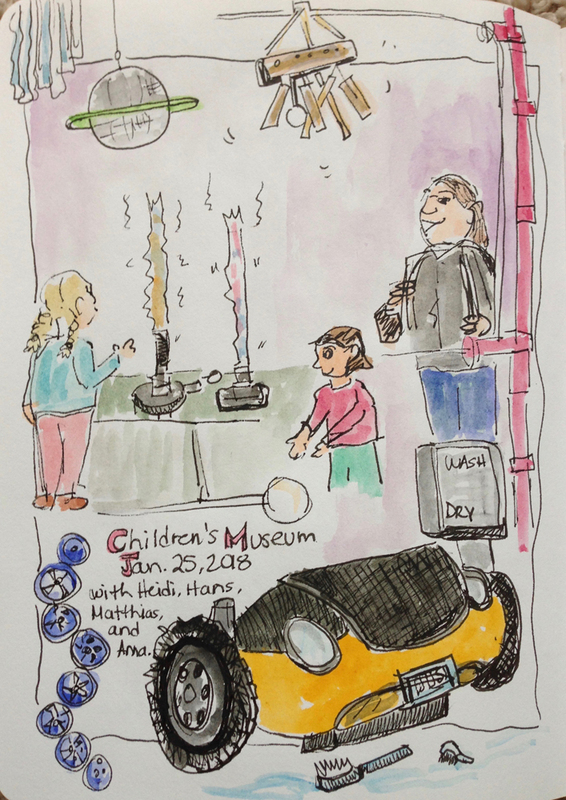 I did a few sketches, mainly of objects—the yellow VW Bug that the kids were washing at the “carwash”, a hanging disco ball with a Saturn ring around it, some kids playing with wind socks, a wind chime made out of bamboo stalks that kids could not stop from pulling, which made an obnoxious banging sound, etc… Everywhere around me was stimulation—noise, light, objects, colors. Sketching people was hard because they moved around too fast. But I had fun anyway!